Combine pecans, butter, 1 egg and cake mix. Press into the bottom of a lightly greased 13X9 inch pan. Combine remaining 2 eggs, cream cheese and powdered sugar in a large bowl. Beat at medium speed until smooth. 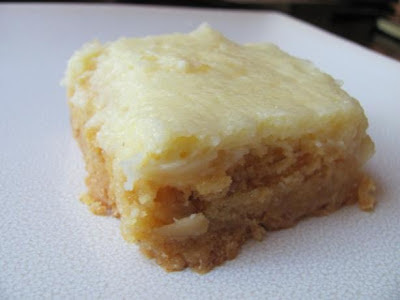 Pour cream cheese mixture over cake mix layer. Bake at 325 for 40 minutes or until cheese mixture is set. Let cool completely in pan on wire rack.